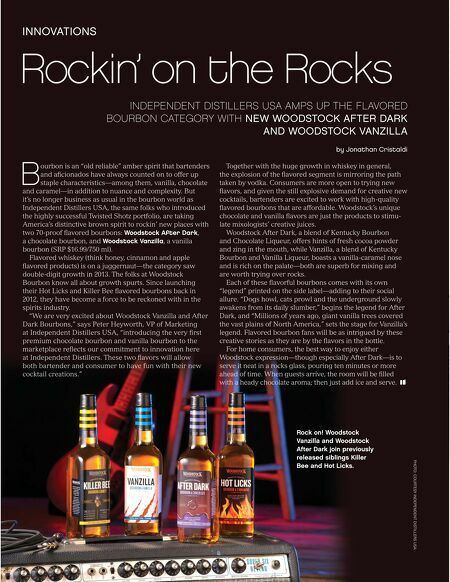 48 / the tasting panel / march 2014 INNOVATIONS PHOTO: COURTESY INDEPENDENT DISTILLERS USA Rockin' on the Rocks INDEPENDENT DISTILLERS USA AMPS UP THE FLAVORED BOURBON CATEGORY WITH NEW WOODSTOCK AFTER DARK AND WOODSTOCK VANZILLA B ourbon is an "old reliable" amber spirit that bartenders and aﬁcionados have always counted on to offer up staple characteristics—among them, vanilla, chocolate and caramel—in addition to nuance and complexity. But it's no longer business as usual in the bourbon world as Independent Distillers USA, the same folks who introduced the highly successful Twisted Shotz portfolio, are taking America's distinctive brown spirit to rockin' new places with two 70-proof ﬂavored bourbons: Woodstock After Dark, a chocolate bourbon, and Woodstock Vanzilla, a vanilla bourbon (SRP $16.99/750 ml). Flavored whiskey (think honey, cinnamon and apple ﬂavored products) is on a juggernaut—the category saw double-digit growth in 2013. The folks at Woodstock Bourbon know all about growth spurts. Since launching their Hot Licks and Killer Bee ﬂavored bourbons back in 2012, they have become a force to be reckoned with in the spirits industry. "We are very excited about Woodstock Vanzilla and After Dark Bourbons," says Peter Heyworth, VP of Marketing at Independent Distillers USA, "introducing the very ﬁrst premium chocolate bourbon and vanilla bourbon to the marketplace reﬂects our commitment to innovation here at Independent Distillers. These two ﬂavors will allow both bartender and consumer to have fun with their new cocktail creations." Together with the huge growth in whiskey in general, the explosion of the ﬂavored segment is mirroring the path taken by vodka. Consumers are more open to trying new ﬂavors, and given the still explosive demand for creative new cocktails, bartenders are excited to work with high-quality ﬂavored bourbons that are affordable. Woodstock's unique chocolate and vanilla ﬂavors are just the products to stimu- late mixologists' creative juices. Woodstock After Dark, a blend of Kentucky Bourbon and Chocolate Liqueur, offers hints of fresh cocoa powder and zing in the mouth, while Vanzilla, a blend of Kentucky Bourbon and Vanilla Liqueur, boasts a vanilla-caramel nose and is rich on the palate—both are superb for mixing and are worth trying over rocks. 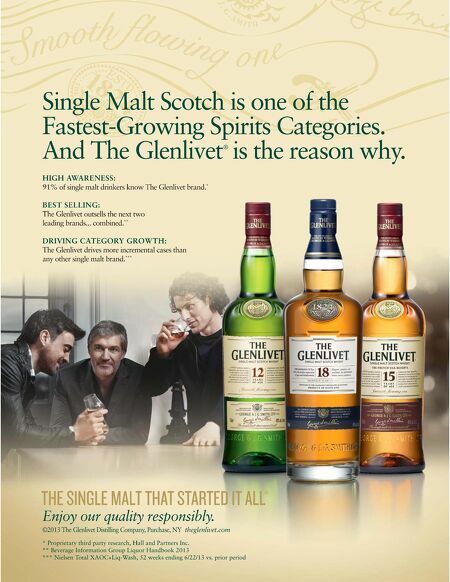 Each of these ﬂavorful bourbons comes with its own "legend" printed on the side label—adding to their social allure. "Dogs howl, cats prowl and the underground slowly awakens from its daily slumber," begins the legend for After Dark, and "Millions of years ago, giant vanilla trees covered the vast plains of North America," sets the stage for Vanzilla's legend. Flavored bourbon fans will be as intrigued by these creative stories as they are by the ﬂavors in the bottle. For home consumers, the best way to enjoy either Woodstock expression—though especially After Dark—is to serve it neat in a rocks glass, pouring ten minutes or more ahead of time. When guests arrive, the room will be ﬁlled with a heady chocolate aroma; then just add ice and serve. by Jonathan Cristaldi Rock on! Woodstock Vanzilla and Woodstock After Dark join previously released siblings Killer Bee and Hot Licks.